4 What to think about when choosing the right for your needs? Lilo, pool lounge, pool air mat…depending on where you are in the world, you might have heard an air mattress being called all these names. But it’s been a long time since an air mattress moved from being a flotation device for our pools and beaches and evolved into a piece of furniture that moved into our homes. If you are looking to get one or simply want to know more about them, this page is the one resource to rule them all. It was 1889 when a company names “The Mattress and Cushion Company”. The smart folks from Reading, Massachusetts obviously spent a lot of their creativity into naming to the company (cough, cough), so they had to live up to the expectations by bringing something completely new and different to the market. They called it the pneumatic mattress and advertised it as “An Ideal Resting Place” and offered a free trial use of 30 nights. The cost at the time was $22 for an adult size and $11 for crib size. In reality, it didn’t really live up the marketing promise since it had more in common with the inflatables you see around beaches today, then the modern air mattresses we bring into out houses today. However, it did not lack in marketing appeal since it was the first bed that you can pack small and store onto a shelf, which made it an ideal solution for all those people pouring in from rural areas and being jammed into small studio apartments in big cities at the beginning of the 20th century. Today, air mattresses have moved into our homes and even became part of high-end interior design, especially the luxury air mattresses mounted on top of adjustable bed frames. They were also an ideal substitute for the mattresses used on the steamships that were filled with hair, bulky and an ideal breeding ground for a plethora of diseases. Although one could argue that the construction of an air mattress didn’t change much (its air trapped in chambers) it actually did. When it comes to modern air mattresses, a lot has changed, starting from the way the airbeds are inflated, materials, internal design to the way we use them. As time went by and some of the design faults like the airbeds losing air, the hassle of inflating them using leg or hand pumps (which are today usually an added option for campers), the bed bottom being slippery, etc. people started seeing the benefits (health and otherwise) of an air mattress that they didn’t see before. Bear in mind that the kind of air mattresses we are talking about here are not cheap air mattresses that can even have a negative impact on your sleep patterns. We are talking about high-quality air mattresses that are stable enough to make the advantages of air mattress count. The high-quality models give you the flexibility to adjust the firmness and keep it at that point all night long (secondary pump used, also known as “never-flat”). This allows you to choose the setting that minimizes the hip and shoulder pressure points that are most often the cause of the back pain in the first place. The luxury air mattresses (that come with a hefty price tag) even allow you to choose different firmness settings for the two halves of your mattress, warm one side while cooling down the other, even have one half inclined or reclined. However, to get the main benefit, and that’s still the option to chose the right firmness, a regular air mattress with a normal price tag will certainly do the trick if you know what to look for and choose right. That’s why an air mattress solved back and neck pain problems for a number of people and became their everyday solution and a replacement for a regular spring mattress. For the people who are bound to a bed for prolonged periods of time a medical air mattress (otherwise known as low air-loss, alternating of pressure relief) might be the only option for avoiding bed sores. These beds utilize air chambers that constantly shift the pressure points and thus prevent bed sores that appear from a constant pressure to certain areas of the skin. The materials used are usually breathable, waterproof, anti-microbial and machine-washable. Rushes of cold air – if you are sleeping in a cold room, the air circulating inside the air mattress is likely to “hit” the sleeping surface at some point and you might feel a rush of cold air. That’s why a foam mattress topper and an air mattress are a match made in heaven. Heat entrapment – the materials that are used to make most air mattresses are not as breathable as the clot of a regular air mattress and on warm nights this can become a problem as the heat becomes trapped between your body and the sleeping surface. Going with and air mattress with a flocked top and, again, combining it with a good foam topper is a pretty good solution). Punctures – no matter how bold the claims in the specs of an air mattress, it cannot be “puncture-resistant”. It can, however, be more or less prone to punctures. Apart from making sure the surface you place it on is smooth, there are few more rules of thumb to picking a reliable airbed. Generally, the thickest PVC makes for the most durable the air mattress, so when choosing, don’t settle for anything less than 0.4 mm or choose an airbed that’s either reinforced or completely made of textile. Slipping and tipping – with the high-quality brands, these two are pretty much a non-issue nowadays. The top-rated inflatables usually feature some sort of sure-grip bottom to keep the bed in place and are stable enough (sturdy edge air beams) not to tip over, even when few people are sitting on the sides. What to think about when choosing the right for your needs? Air mattresses come in pretty much the same sizes as regular mattresses, although it’s often the case that not all of them come in all sizes. While regular air mattresses are often made on demand, air mattresses are made in stock and since there is no substantial need for all sizes the companies respond to the market demand. This means that most of the better airbeds are available in Twin, Full and Queen, with the other sizes like: Twin XL, Full, King, California King available only from certain brands. If you are looking for an airbed for your dorm or for a younger guest, a low rise can be an option, especially if space is an issue. The low-rise air mattresses come in the same sizes (width and height) but are 8-10 inches high. They are rarely a good choice as a permanent bed since they lack support and sturdiness. They are also not a good option if you have elderly guests around since they are hard to get in or out of. A good choice of a high-rise air mattress and you’ll barely be able to tell the difference between high-end latex or spring mattress and a well-made air mattress…just as sturdy, comfortable and supportive. Most of the time, the high rises are 18-22 inches tall. 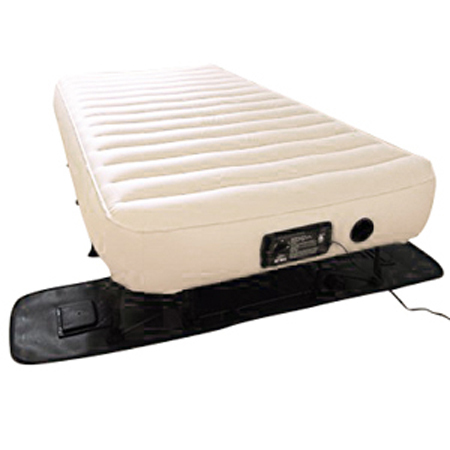 An EZ airbed is pretty much a different name for an airbed mounted on a metal frame. It does sound bulky but the few EZ models that are available are a work of art. You plug them in and the tightly packed frame starts unfolding like a mechanical spider and becomes a full bed within minutes. It’s even fun to watch, it’s like a scene from one of Transformer movies (expect more interesting). EZ beds are a good option if you are driving to your camping site and prefer to have the feeling of being elevated from the ground. It is probably the closest you can come to the feeling of a regular bed on a camping trip. They are, however, more expensive. People that are extra tall might have to dig a little deeper and some more research before they opt in for an airbed. Only a handful of models offers XL models and the XL here (unlike with clothes) stands for extra long and are a few inches longer. Extra big people should simply look at three things: the maximum burden the mattress can take as per the specs and browse through user reviews to see if the claims are actually true and the airbed is indeed extra durable. Note: The most durable airbeds will have thicker vinyl (usually 0.6 mm). Just pick a few air mattresses, compare them in the categories we just mentioned and you’re on the right track. On the complete opposite of the spectrum, since last year, we have the guide on the airbeds for kids and toddlers. Whether it’s for camping or your home, the matter of choosing a heavy-duty air mattress that will serve you well for the years to come can be a confusing issue mo matter how many reviews of air mattresses you read and how much research you do. As we mentioned, the issue becomes more important if you are looking for a durable bed for a big, heavy person. So let us cut through the clutter and get specific about what to look for. As we mentioned, most of the time the air mattresses that will perform better will be the ones in the range of 0.4 to 0.6 mm. It is, however, just a reference, because if a mattress is not well made (weak connections or internal structure, inferior glue used) and no matter how thick the vinyl the bed might still leak air. Combine it with what people are saying about it in the reviews of the product and you get a much better picture about the actual quality. Provided that you don’t puncture the mattress, air leaks can still be an issue. In inferior inflatable beds air can find it’s way out at the connections, near the pump, through the valve…so, making sure that you choose a trusted brand and a product that stood the test of time and possibly going with a never-flat pump goes a long way. It is only natural that the pressure within the mattress will vary depending on the temperature and humidity but those kinds of “native” issues are easily solved by topping it of for 30 seconds every few nights or once a week. Combine the three tips listed above and there’s very little chance of choosing wrong. The setting and the placement of the airbed determines a lot when it comes to comfort. If you plan to use it when you have guests over and your space only allows for the bed to be inflated in the middle of the room, chances are your guests will be chasing their pillows across the edges of the bed. If that’s the case, you might look into an airbed with a frame that keeps the pillows in place. But the main feature to keep in mind – chambers beat end-to-end beams every time. All of the above is better in airbeds that feature some sort of chambered design. The air mattress brands all have different names for their technologies but beyond the fancy terms is a simple internal design approach that divides the mattress into multiple air chambers that act as coils in a regular mattress. The chambers do a much better job at weight distribution. This means better weight distribution, better support and no sinking to the middle of the bed. Then, when you’ve chosen the right inflatable, you can think about adding toppers and making the blow up bed more comfortable. It’s a long known fact that having a baby sleep on air mattress is not a good idea because of the suffocation cases that have been reported. That’s the one safety concern mentioned when it comes to safety of an airbed. The other is the chemicals in the PVC and this one, has been proven as a myth, especially in quality airbeds. The regulations are strict and the chemicals that have been a concern are not used for a long time now. Furthermore, as reported by users (shown in the graph below), an air mattress (in spite of the plastic smell that can linger for a few days) actually has the lowest gas release (off-gassing) of all the mattress types. It is a confusing time and a confusing market, that’s a fact. If having a few of these tips on your mind helps you choose better, we’ll sleep tight, whatever the mattress.